This volume discusses latices in surface coatings in regards to diverse applications. These water-based latices are playing a far greater role in many applications and match the growing concern over environmental safety. This book is available separately or as part of a 3-volume set and offers an insight into the advances and developments in this field. As a comprehensive account of the science of polymer latices, these volumes are an invaluable resource for research workers and end-users in academia and industry working on water-based paints, adhesives, emulsions, dispersions and coatings. The production of polymer latices has developed over the past half-century from pioneer status to a major industry with an annual production of over 6 million tonnes of polymers. Over this period, increased understanding of their many technical applications has extended the usefulness of water-based latices both technically and commercially. With present trends in ensuring environmental safety, water-based latices play an ever-increasing role, overcoming the limitations of water-soluble and solvent-based polymers in a diverse range of applications. This title is one of a three volume set entitled The Applications of Synthetic Resin Latices, which discusses the preparation and application of specific groups of latices or polymer emulsions. Volume 3 Latices in Surface Coatings: Diverse Applications covers the principles and practice of use of latex-based systems in building and construction products, paper coating, textile treatment, polishes, leather finishing and many other specialised applications. H. Warson is the author of Applications of Synthetic Resin Latices , Volume 3, Latices in Diverse Applications , published by Wiley. C. A. Finch is the author of Applications of Synthetic Resin Latices , Volume 3, Latices in Diverse Applications , published by Wiley. 4. 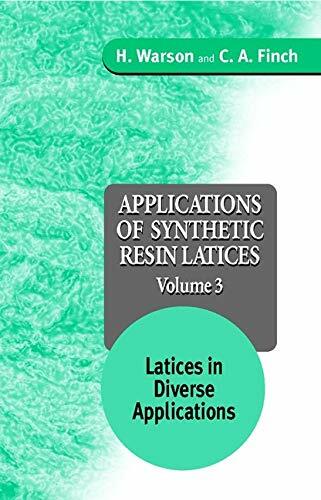 Applications of Synthetic Resin Lattices Volume 3: Lattices in Diverse Applications [Hardcover] Warson, H. and Finch, C. A.